breadworks’ Christmas stollen is now available! Enjoy a slice at a time all the way until Christmas. 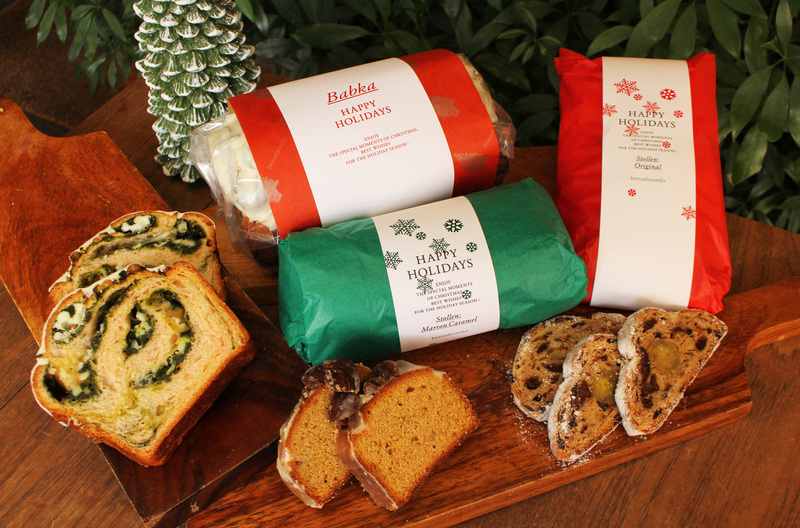 This year we offer 2types stollen including original and marron & caramel and White Chocolate& Matcha Babka. breadworks’ original take on the classic holiday stollen is made with an almond paste including chopped pistachio bits and liquor-infused fruits such as raisins, figs, lemon, oranges and cranberries. The roasted almonds gives this an extra crunch. The dried fruits and nuts blend well within the stollen, giving it a richer flavor as time passes by. This unique stollen uses French marron paste and homemade caramel, topped with a French marron glace. Enjoy the light aroma of the rum and the flavors of the different ingredients. The combination of matcha green tea and praline amande rosé make this Christmas limited white chocolate Babka an irresistibly sweet treat!